I don't read contemporary YA novels at all, so I was surprised by how much I liked this. 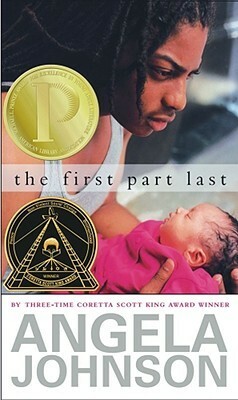 The First Part Last is about sixteen year old Bobby who gets his girlfriend Nia pregnant and now has to deal with the consequences. The novel alternates timelines between 1) Bobby finding out he's going to be a father, and 2) Bobby actually dealing with being a father. In the first, he goes through several phases. Shock, when his girlfriend Nia tells him she's pregnant on the day of his birthday. Fear, when they have to tell his parents, and then later her parents. More fear, when it all starts to slowly sink in as he accompanies Nia to doctor appointments and the adoption agency. Through it all he does the best that he can, and though he'll often have thoughts about how much he doesn't want to be in that position, he never backs out because Bobby really cares about Nia. He knows he screwed up, and he knows he has to at least try to make things right. In the second timeline, we see all the hardships Bobby has to go through to take care of Feather, his newborn daughter. He's raising her by himself because something has happened to Nia, but we don't find what until the very end. And he never talks about her, so we don't get any hints as to where Feather's mother is. Again we see Bobby thinking on several occasions about how much easier his life would be if only he didn't have a baby. When he takes Feather to the doctor, he says he wishes he could get "a note to get me out of it. Just one note." But there is not getting out of fatherhood. I thought this was a great technique for the author to use. She does a really good job of presenting all the hardship teenager parents will go through by having Bobby always reflecting on things he could be doing, and instead he has doctor appointments with his daughter, he has to keep up with school, he has a babysitter who lives across town so he has to get up extra early to take his daughter there before school, and he has a mother who won't really help him out because she wants him to learn responsibility. I guess what I really liked about it is that though its clearly about a lesson, it's not so heavy handed delivering the message. I didn't feel preached to, I just felt I was reading a really great story of a teenage father's life. The only criticism I would give is that Bobby seems to be too good. What I mean by that is though he does resist fatherhood in his mind by thinking of things he rather be doing, in the end he still does what's right. I would've expected more resistance or more trouble from a teenager facing this kind of situation. I'm not gonna get out of this. She wants a pizza at ten o'clock on a Saturday morning, and the quiet on the other side of the phone means she's as serious as a heart attack. I look at the adoption papers stacked in front of me, then fold them in half before I tear them. "No, I don't know anything about raising a kid. I'm sixteen and none of those people on the wall look like the kind of family me and Feather's gonna be. But I'm doing it." I don't know any of the parent rules, but crying like a baby when you just decided to keep a baby probably shouldn't happen.